Keith Johnson, a photography instructor, has bequeathed to us prints from his rare, antique glass plate negatives. He has identified this one as a photo of the City of Peoria. 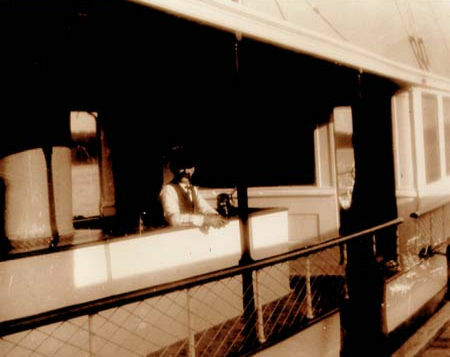 According to Fred Way's steamboat guide, there were two boats named City of Peoria. The first one was built in Peoria, Illinois in 1872; weighed 4.33 tons. In 1874, owned by Jacob Schafer, registered at St. Louis. Still documented 1876. 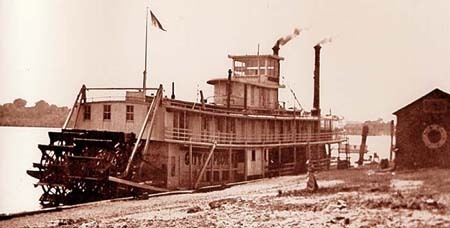 The second was a sternwheeler, built in Jeffersonville, Indiana, by Howard, 1892. It was 130 x 26 x 4.5. Engines, 13's - 6ft. Three boilers, 34" by 20 ft. Owned by Capt. Sol York, in Peoria-Henry trade. Later owned by G.M. Sivley and others. Ran New Orleans-Bayou Teche November 1910, Capt. Warren Kounz, pilot. Capt. W.L. Berry, Paducha, bought her at a U.S. marshal sale fall 1913. Burned at Cairo, Illinois, Sept 7, 1914. The machinery was taken to Paducha and put on towboat White Spot built there that fall. Another print from Keith's glass plate negatives, this one of a man standing on the boat.